And I bet you will, too! 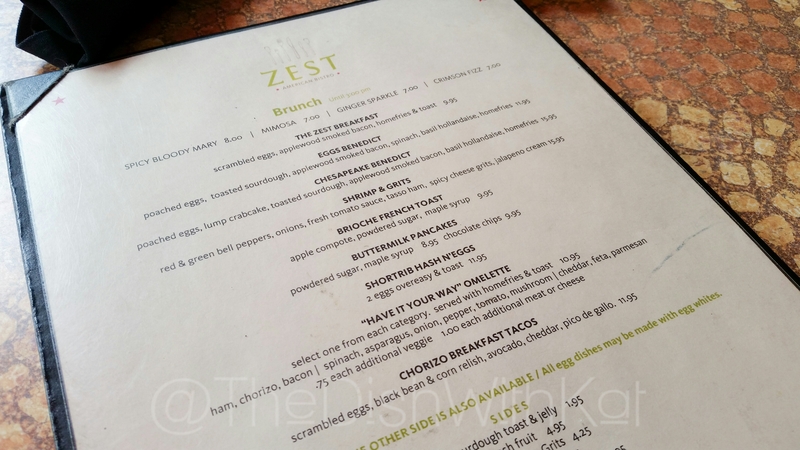 Follow The Dish With Kat on WordPress, Instagram, Twitter, and Facebook (I’ll follow back!). Follow Blue Apron on Instagram, Twitter, Facebook, and Pintrest. Send an email to contact@thedishwithkat.com by 11:59 p.m. on Monday, February 8, with your full name and social media handles. Please note, I can only share these meals with new customers. If you’ve subscribed to Blue Apron in the past, I will not be able to share the free trail with you to the email you previously subscribed with. The giveaway will close at 11:59 p.m. on Monday, February 8; all email submissions must be received by then. I can’t wait to see what you cook up! Here’s the dish! I love to entertain, but I don’t do it much because I have small living quarters. 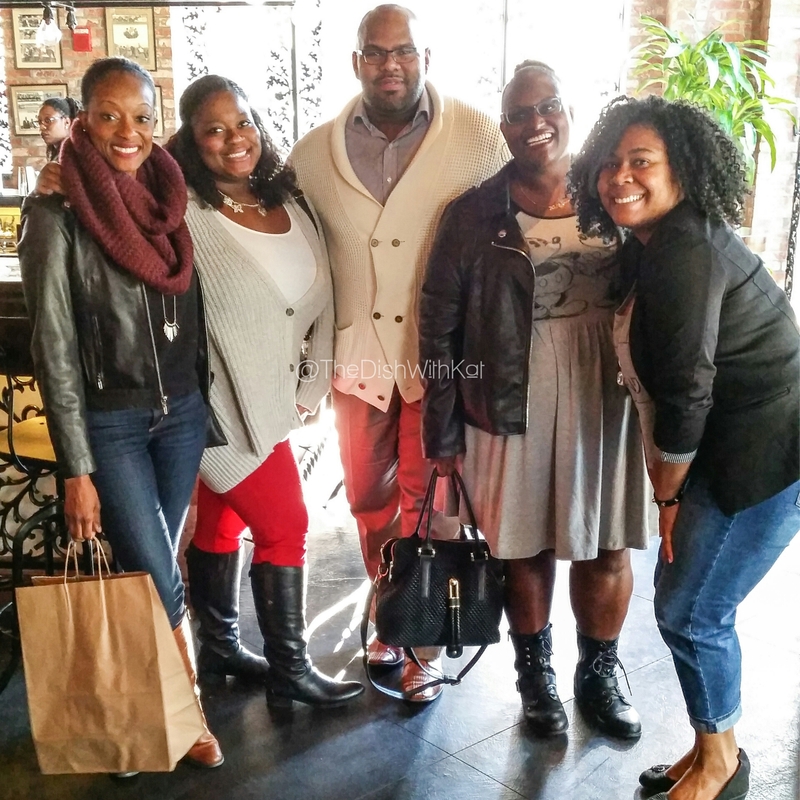 For the past few years, I have had friends over on New Year’s Day for a traditional southern meal of Fried Chicken, Macaroni & Cheese, Collard Greens, Black Eye Peas, Cornbread, Chocolate Chip Pie, and the best Red Kool-Aid you’ve ever had. In southern culture, we eat Collard Greens to represent financial prosperity and Black Eye Peas for good luck in the coming year. The Cornbread, well that’s for sopping up all that southern goodness. After having a spectacular Thanksgiving with the Jenkinses, I thought I’d take to the blog to share with you all some of my family’s most delicious southern dishes. My maternal grandmother, Susie Mae, was one of the best cooks I’ve ever known. When grandma cooked dinner for the family, every plate was clean, every stomach was stuffed, and a full onset of the itis came soon after we took our last bite. When my mom left her hometown of Florala, Ala., she would call my grandma and ask her how to cook some of her favorite dishes. She ended up being the next best chef in the family. Because I loved food so much, I started shadowing my mom in the kitchen at a fairly young age. She taught me the basics, and as I grew older and my palette became more sophisticated, I started experimenting more in the kitchen and loved the journey of making delicious food for myself, my family, and my friends. The thing I loved about my grandma’s cooking was that it was simple and delicious. She didn’t come up with crazy spice concoctions (her staples were just salt and pepper) and the recipes were simple enough for a child (that child being me) to follow them. While I like to explore in the kitchen, when it comes to the southern staples, I follow her vision and keep it simple. Smoked Ham Hocks are God’s gift to the world and an essential part of many southern-style vegetables. Essentially, the ham hock is the knuckle in the joints of the pig’s legs. They are meaty, fatty, salty, smoky, and just down-right delicious. Some people prefer smoked turkey in their greens instead of the ham hocks, either because they don’t eat pork or they are going for a healthier alternative to cooking with smoked meat, but around our neck of the woods, we prefer pork over turkey any day. Growing up, my mom always cooked ham hocks in a pressure cooker. Because of its explosive nature, however, I skip the pressure cooker and cook mine overnight in a slow cooker. 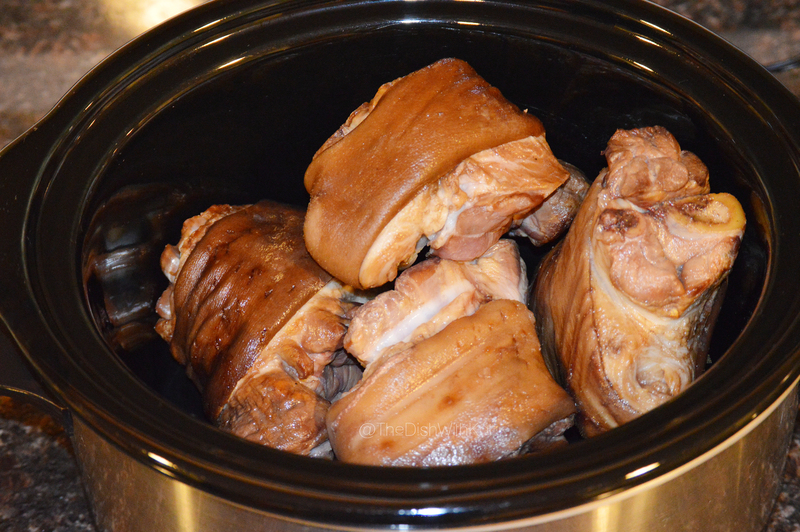 Check out the simplest way to cook up ham hocks, which will be the base for both the Collard Greens and Black Eye Peas. Collard Greens might be one of my favorite greens. Whole Foods will try to convince you they are next trendy super green, but collards have long been staple at southern holiday meals, especially New Year’s dinner. The leafy greens represent financial prosperity for the new year, so you will most certainly find a pot of them simmering on stove tops across the south on January 1st. People often do the absolute most to greens. Most of this is due to the fact that they cook them with smoked turkey meat, which, in my humble opinion, doesn’t pack the same flavor as a pork base. If you are still among the few people who eat pork, the best way to cook up Collard Greens is with deliciously Smoked Ham Hocks. They provide the right amount of smoky and salty flavor to make your greens delicious and tender. Now, I wouldn’t suggest cooking them with ham hocks throughout the calendar year, but that special stretch of holiday time between Thanksgiving and New Year’s Day, ham hocks are the way to go! My grandmother’s recipe contained only five simple ingredients and will have you hiding plastic containers of your collards before the family comes over and scrapes the pot clean! 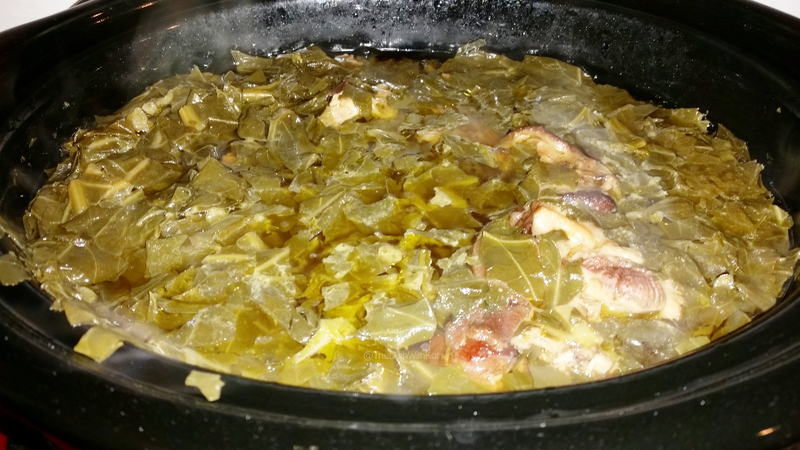 Check out this simple recipe for Southern Collard Greens with Smoked Ham Hocks. I only cook Black Eye Peas for the new year because of they represent good luck. The other 364 days (or in this year’s case, 365 days), I indulge myself with other legumes, usually from a can. 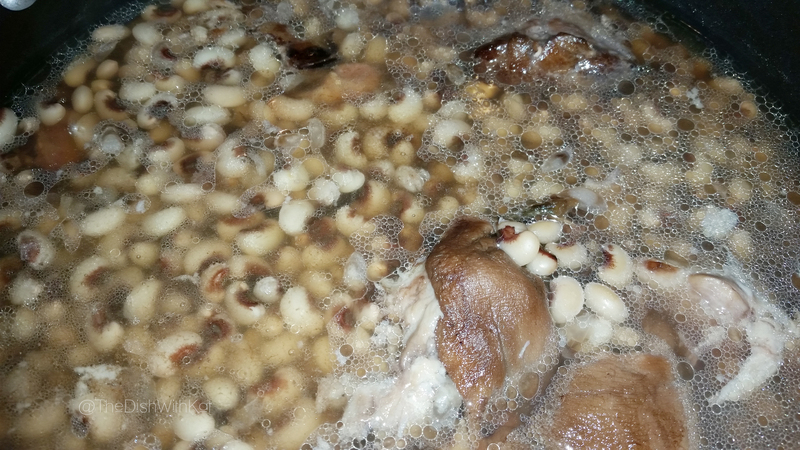 The fact of the matter is, cooking dry peas and beans can be a laborious process. I just don’t have time to search for stones and soak them overnight. My grandma is in heaven looking upon me with disdain, but my mother and I have made this dish super easy by using frozen peas. 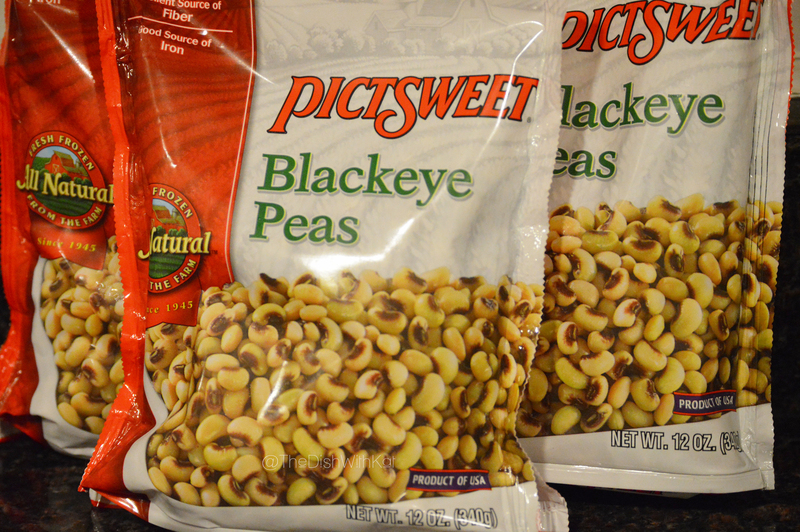 Yes, you can purchase Black Eye Peas in your grocer’s frozen vegetable section! I’ve also seen them pre-soaked and in the produce section of different grocery stores. It makes life so much easier, but plan ahead for the new year because the prepped variety go fast! Use a Smoked Ham Hock and a cup of its cooking water as the base, and simply add the frozen peas (after rinsing, of course), cover with low sodium chicken broth (water will also work), and add salt to taste. Cook them for at least an hour until tender, and voila, you have perfectly cooked Black Eye Peas. As I mentioned in my recipe for Southern Collard Greens with Smoked Ham Hocks, you can leave the ham hock whole or remove the bones and fat and only serve the peas with the meat. You can also serve them with rice for a southern delicacy we call Hoppin’ Johns. Either way, you’re in for a simple, delicious treat that will bring you luck in the months to come! Similar to Collard Greens, people tend to over do Fried Chicken. People are usually surprised to find out, after biting into a perfectly golden brown piece of my chicken, that I only use Lawry’s Seasoned Salt and coarse black pepper to season the chicken. Yep, that’s it! Now my mother and I disagree on one thing when it comes to Fried Chicken, and that’s whether to season the flour you dredge it in or not. My mom tends to season the meat more heavily and use unseasoned flour, but I stick by seasoning the meat a bit lighter with the seasoned salt and using regular salt and pepper to season the flour. It always baffles me at how intimidated people are by deep frying. You don’t need to have an actual deep fryer to achieve that crispy crunch. Instead of using a frying pan, use a large pot; I use a standard 6-quart stainless steel pot. The trick to achieving the deep fry is cooking with enough oil. When I’m frying up chicken for a large group, I just go ahead and purchase the gallon-size jug of vegetable oil. You need enough oil to fill 2/3 of pot you’re frying in. Now, I know what you’re thinking: What on earth am I going to do with all that oil when I’m done?! Well, you best not throw it away! There are certain things that are staples in southern homes, and a jar of chicken grease is one of them. Jars of bacon grease and fish grease (which should be stored separately because you normally dredge fish in cornmeal instead of flour) would be other staples, in case you are wondering. As long as you don’t burn your chicken, you can use the frying oil again and again and again. I don’t deep fry food often, so it’s good to have some on hand and not have to buy it every time I want to indulge myself. Just allow it to cool completely, and using a strainer, transfer it to a glass jar and store above your stove (you can really store it anywhere but that’s where my grandma kept hers, so that’s where I keep mine). One of the great debates of our time will be the proper way to cook Macaroni & Cheese. On one side, you have the people who prefer a cheese sauce-based recipe and, on the other side, a custard-based recipe. Being a southerner, I grew up eating a custard-based casserole. As I learned to cook using different techniques, I began to experiment in the kitchen. What I learned is, combining both cheese sauce and custard makes for the most deliciously creamy Macaroni & Cheese you will ever taste. Some might be intimidated by the thought of making homemade cheese sauce, but it’s quite a simple cooking technique that can be used in a number of dishes. 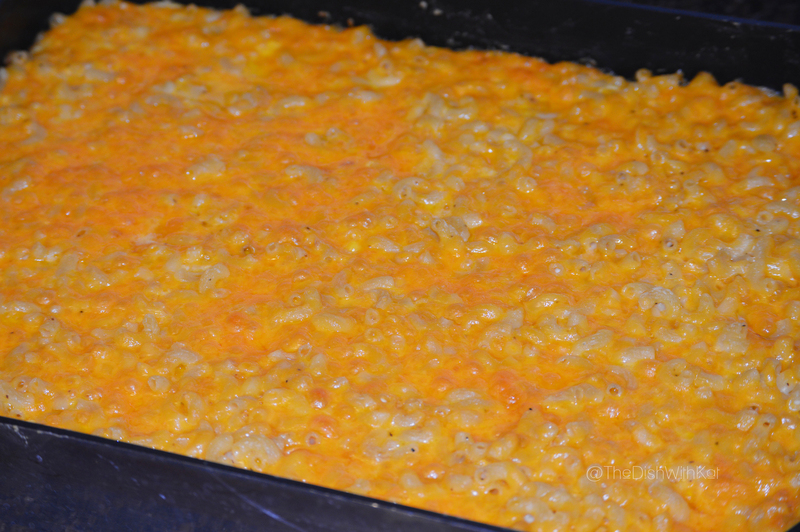 Check out my easy recipe for Kat’s Southern-Style Macaroni & Cheese. Try not to go around slapping your momma after you eat it. Are you ready to revoke my southern card and never trust a word I tell you again? I’m not the biggest fan of Cornbread. There, I admitted it. I’ve always preferred a good yeast roll over cornbread. However, because it’s a part of the southern tradition, I cook it for the new year. Now, I’ll be the first to admit, I’ve served up some good ol’ Jiffy Cornbread in years past. I love its sweet, cake-like taste. 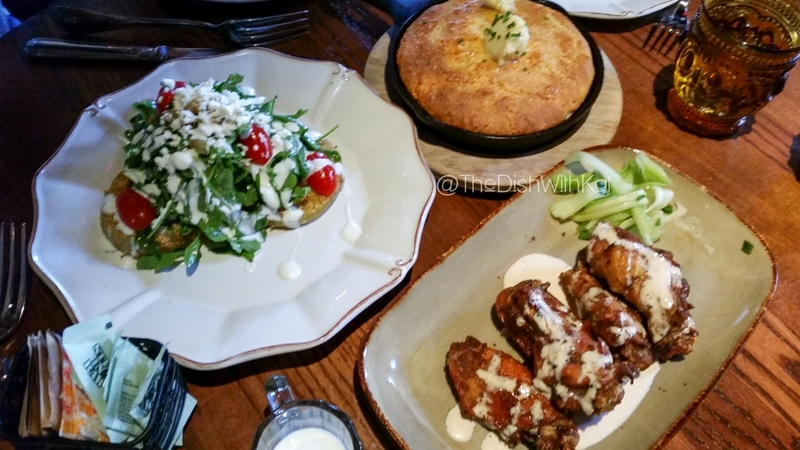 But, let’s be real, I wouldn’t dare blog about serving up boxed cornbread for a holiday feast! 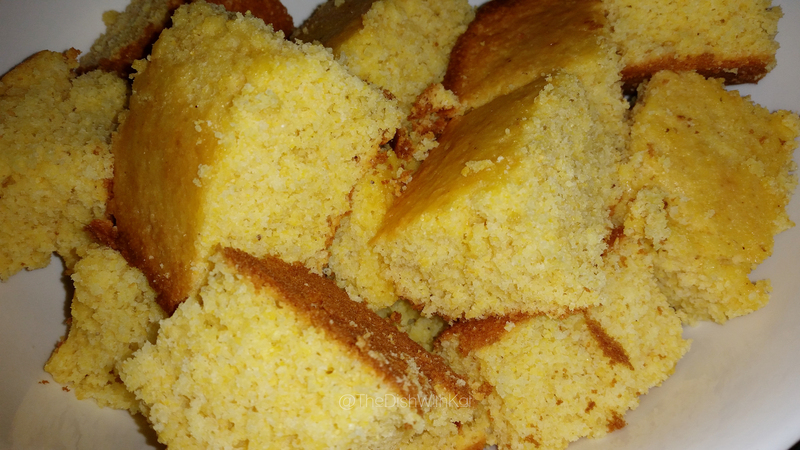 The first time I attempted to make cornbread from scratch, I used white cornmeal, and it didn’t come out as expected. It was going in some dressing, so it didn’t really matter anyway, but I knew I had to find the perfect yellow cornmeal for my New Year’s dinner. I scoured the store shelves, reading recipes on the back of the bags until I decided on Indian Head Old Fashioned Stone Ground Yellow Cornmeal and its recipe. Check it out! I’ve always preferred cake over pie. There’s something about the light fluffy layers and the perfect ratio of cake-to-frosting that makes me happy all over. Growing up, one of my best friends’ mother introduced me to a pie that would change my life. Patsy’s Chocolate Chip Pie is pretty much the love child of a cookie cake and a pie. When I come home for the holidays and visit with my friend and her family, we eat the pie. I laughed hysterically when my friend told me about her cousin’s rant the Thanksgiving there was no Chocolate Chip Pie. Now, I would never recommend you curse out your elders for not making your favorite dessert during the holidays, but know, it’s that serious. 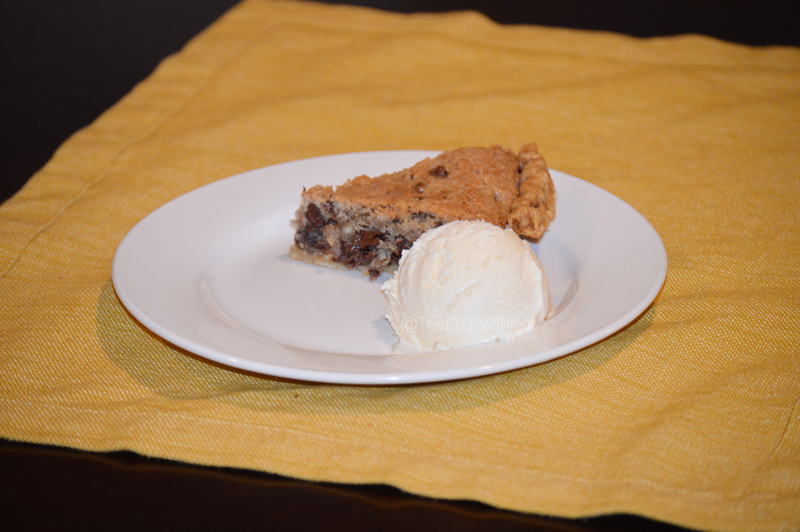 Check out this super simple and delicious recipe for Patsy’s Chocolate Chip Pie. Hosting can be a bit overwhelming, especially in a small space. However, I managed to pack 13 friends into my tiny, 600-square foot condo, and we enjoyed this delicious New Year’s Dinner together. I was excited to share some of my family’s traditions with them, many of whom came from regions where this tradition was not celebrated. I managed not to take one single photo of the group, but after our dinner, we partook in a hilarious game of Cards Against Humanity, which I happened to win. This inappropriate game is becoming just as much a part of my dinner’s tradition as the food. Thank you to everyone who joined me this year. May 2016 be bountiful and prosperous for all! Until next time, folks! Keep dishing! Here’s the dish! I love being snowed in! My snow days are filled with Netflix and great food. 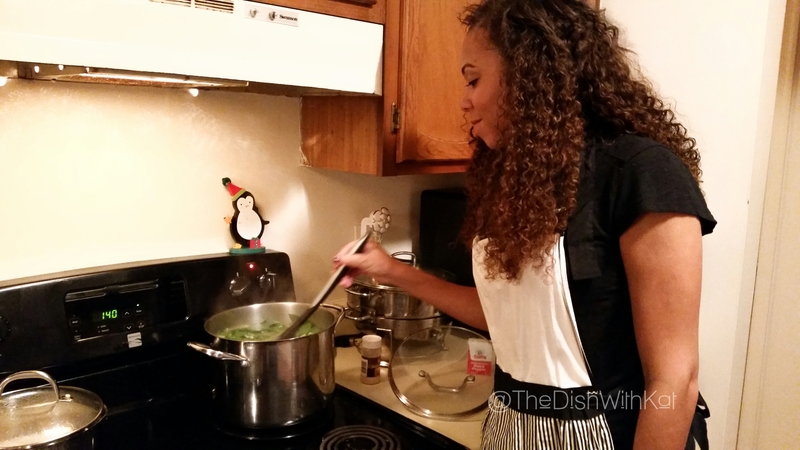 Show me what you’re cooking up by using #SnowedInWithKat and check out what I’m cooking by searching that hashtag. Be sure you’re following me on Instagram, Facebook, and Twitter! I hope you’ll join me for this virtual food fest! Nothing comforts you when you’re under the weather like a hot, hearty bowl of soup. When I woke up last Sunday feeling a bit under the weather, I knew I wanted some chicken soup to warm my soul. I didn’t want to go for the traditional Chicken Noodle Soup I ate as a child when I was sick. Instead, I fancied some spicy Chicken Tortilla Soup, something that would open up my sinuses and tickle my palate. Here’s how I created my tasty culinary creation. To start, I heated a large pot of water. Once it was boiling, I added a generous helping of coarse sea salt and added the chicken breast. Boil the breast for about 10-12 minutes and place it in a bowl to cool off. While the chicken cooks, prep your veggies for the soup. Small dice (smaller than bite-sized) the bell pepper and onion; take a portion of the onion and finely chop it then set it aside for a soup topping. Remove the husks and silk from the corn and cut the bottom off the corn. Use the flat surface of the corn to hold the cob steady as you cut around it to remove the kernels. Zest the lime (this is totally optional, but it will add a more intense citrus flavor to the soup) and quarter it. Pick the cilantro leaves off and discard the stems. Roughly chop most of them but leave some whole for a soup topping. Stack the tortillas and cut them in half; stack the halves and cut into strips about a quarter inch wide. Lastly, remove as many of the seeds and ribbing of the jalapeno as you see fit; the more you remove, the milder the flavor, and the more you keep, the spicier the flavor. Take a portion of the jalapeno and finely chop it then set it aside for a soup topping. After handling the jalapeno, thoroughly wash your hands, knife, and cutting board. Whatever you do, do not touch your face and eyes after handling the jalapeno; you do not want any remnants of the pepper getting into your eyes. Once your veggies are prepped, it’s time to start cooking. Preheat your oven to 375°. Heat a large pot on the stove to medium-high and add two to three circles of EVOO to the pot. Add your aromatics—the onion, bell pepper, and jalapeno. You want to cook them until they are softened and fragrant; add salt and pepper to taste. Add about three quarters of the taco seasoning packet (I really like the one from Trader Joe’s because it’s does not have a lot of sodium in it) and the tablespoon of tomato paste. Cook for a few more minutes to thoroughly combine them with the aromatics. Add the whole can of fire-roasted tomatoes, juice and all, and the entire carton of chicken broth. Bring this to a soft boil and taste it for seasoning; add salt and pepper if needed. Drain and thoroughly rinse the black beans, then add them to the pot with the corn kernels. Add the chopped cilantro, lime zest, and juice from three of the lime wedges. Continue to let these flavors meld in the pot while you work on the chicken. Shred the cooled off chicken into bite-size pieces. There are a few methods I use for shredding chicken. If it’s a small amount, such as this one breast, you can use your fingers or two forks, pulling them in opposite directions to shred the chicken. If you doubling this recipe or just need to shred a bunch of chicken, use a hand mixer if you have one. I recently stumbled upon this kitchen hack via a Facebook video, and it’s changed my life. Check out this YouTube video to see the magic! 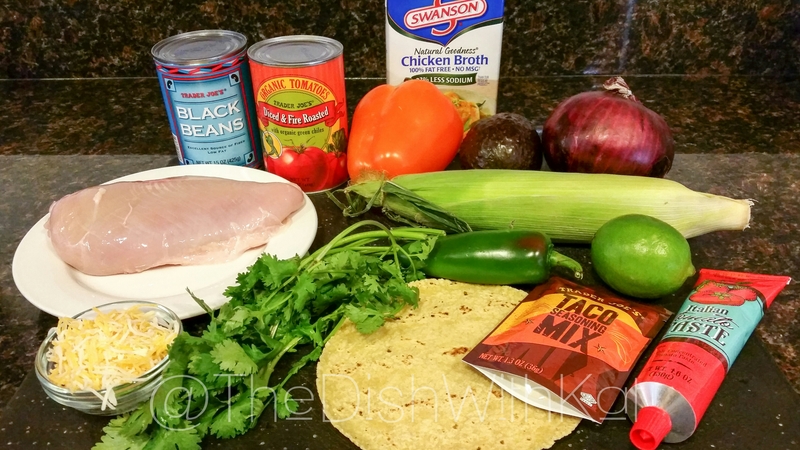 Add the remainder of the taco seasoning and salt and pepper to taste, then add the chicken to the pot of soup. 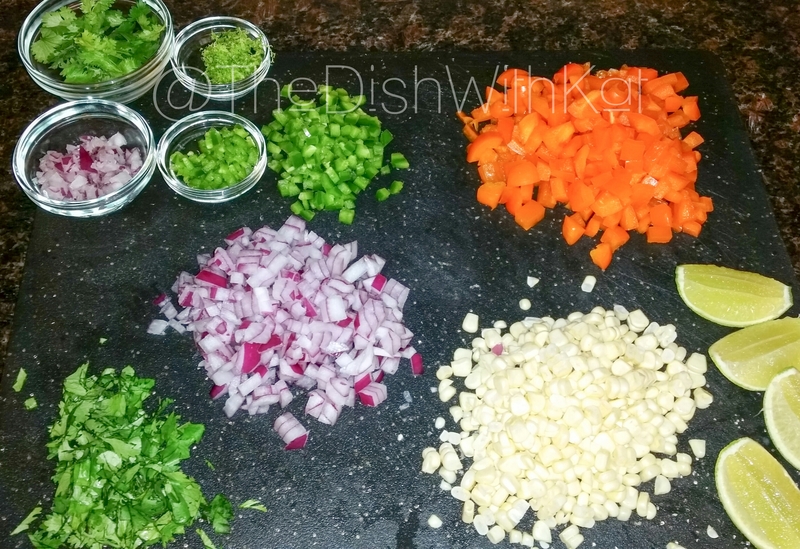 While the soup simmers, prep your soup toppings for garnishment. Spread the cut tortillas on a baking sheet and drizzle with EVOO and salt and pepper. Toss them until they are all generously coated and seasoned. Spread the strips into one layer (you don’t want them stacked on top of each other) and bake them in the oven for about 12 minutes until golden brown and crispy. Take your knife and run it lengthwise around the avocado; twist the two halves until they separate. Use your knife (if you know what you’re doing) or a spoon (if you don’t know what you’re doing) to remove the avocado pit. Use a knife to make scores of bite-size pieces in the flesh of the avocado; be sure not to cut through the skin, and especially sure not to cut your hand. Use a spoon to scoop out the flesh and squeeze the juice of the remaining lime wedge on the avocado so it doesn’t oxidize (turn brown). Now it’s time to plate! If you’ve followed me on social media, you have an idea how seriously I take my plating. Scoop a few spoonfuls of the soup into a bowl. Sprinkle cheese on top so that it melts into the broth. Add the finely chopped raw onion and jalapeno. Garnish with a few whole cilantro leaves. Stack a few of the toasted tortilla strips in the center, then top it with a few pieces of jalapeno. The only thing left to do is enjoy the homemade soup you just created! Trust me, you won’t be disappointed, and it’s even better the next day. It will keep in your fridge for about five days and you can place it in gallon-sized plastic bags and freeze it for later. 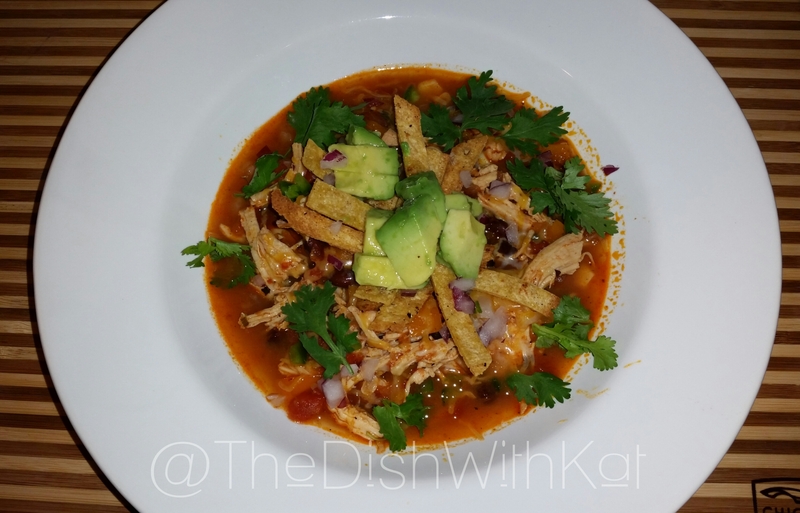 I hope you enjoy this Chicken Tortilla Soup recipe as much as I did! Happy cooking!